Beaducation: The Blog: Horizontal Bar Necklace - Still a HOT HOT Trend! Horizontal Bar Necklace - Still a HOT HOT Trend! The horizontal rectangle necklace (aka, the bar necklace) still sits at the top of the trend charts. We see it long, short, stamped, or sometimes just left plain. Whatever fits your style, we have got the rectangle for you! Rectangles have almost surpassed circles as our most popular stamping blank shape! Our Beaducation designers have been taking the bar necklace one step further. Below are some ways to add more space, dimension, and color to your next bar necklace creation. In the Triple Horizontal Necklace necklace we linked three different metals together. 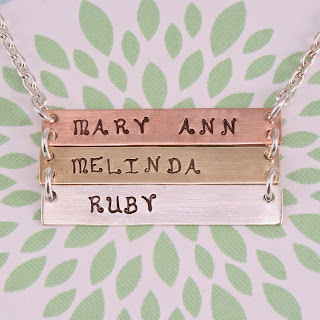 Having three bars gives you the space to stamp more names or words and offers the opportunity to use mixed metals. Using Rose Gold Filled, Gold Filled, and Sterling Silver makes this a high quality keepsake piece. 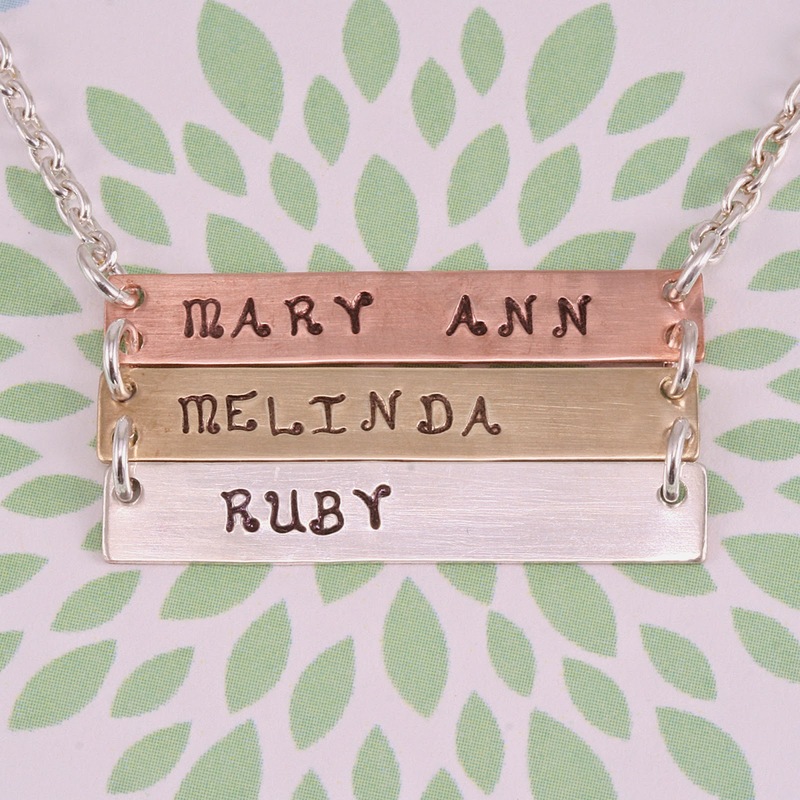 This Secret Message necklace is hiding something. Shhhh! It's a secret! 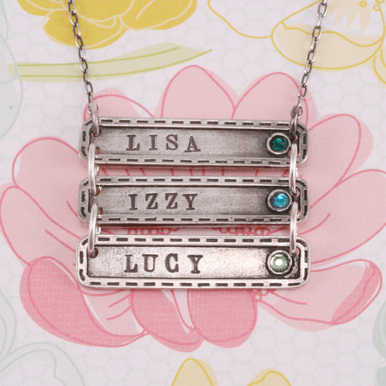 We have stacked a narrow rectangle over a wide one and stamped words to embellish it. Flip the top blank up to reveal your very own secret message. Finally, here is a chance to add color to your piece! This Ladder Necklace uses our pewter rectangle pendant in a fun way. First we cut off the top loop and filed it smooth, then we turned it on its side so it will hang horizontally. This pendant comes with the perfect spot to glue in a Swarovski flat back crystal for an added bit of bling! Remember that with any of these designs, choosing the correct jump ring is key. If the ring is too small, the bars will overlap. If the ring is too large, there will be a lot of space between each bar. There is not a magic recipe for me to give you; it will all depend on where you punch your holes. I usually use a ring around 4mm ID (18g is my go-to jump ring thickness) but you might want to play with different sizes to get your piece to hang exactly the way you like it. Have you started designing with rectangles yet? What look is your favorite? Great items, we focus on customizing bar necklaces.